This tea perfectly captures the essence of the Sara DeSoto chapter of the National Society of the Daughters of the American Revolution. This is the oldest non profit organization in the Sarasota located in historic Payne Park. Early colonists learned about locally grown herbs from the Native Indians. These discoveries played an important role in the protest against taxes the British were placing on tea, which would eventually lead to the Boston Tea Party. Daughters of the Revolution vowed to “drink tea made from weeds” instead of imported tea. Thankfully they chose herbs, fruits and flowers to make their tea and as a celebration of those early beverages we now present them to you in this beautiful tea! A CERTIFIED ORGANIC Rooibos blended with lavender the “Herb of Harmony”, rosehip shells, dried red and black currants, rose petals and bilberries. Heady, perfumed lavender notes with a floral, fresh, fruity and mellow flavor. This is a very relaxing tea for consumption any time of day or night. Naturally caffeine-free. 20 to 25 cups of tea can be made from 2 oz of loose leaf rooibos. We also suggest steeping our Rooibos multiple times for even more cups of great tea. This is a juicy flavored rooibos. I can taste the elderberries and currants more than the floral ingredients but I certainly like that. The rosehips and floral notes are subtle and are a nice gentle touch. This is nice hot but I am going to be trying it ICED soon because I think it will be even better iced! The Spanish explorer, Hernando DeSoto, explored this part of Florida in 1539, and according to legend, he had his daughter Sara with him. Sara met and fell in love with a native warrior by the name of Chi Chi Okobe (pronounced Chee Chee Okobee). He was a member of the Calusa tribe, which inhabited this region at that time. Unfortunately, he contracted a fever and was gravely ill. Sara decided to remain with him and nurse him back to health, but she contracted the fever and she died. Chi Chi Okobe was grief-stricken at the loss of his love. He had her body buried out in the bay. He then sent 100 of his best warriors out to the spot where they chopped holes in the bottoms of their canoes and drowned themselves to protect her final resting place. According to the legend, when you see whitecaps on the waves in the bay, they are actually the feather headdresses of those native warriors still guarding her grave. For more information about Daughters of the American Revolution see THIS Website. For more info about Sarasota’s Chapter see THIS Website. 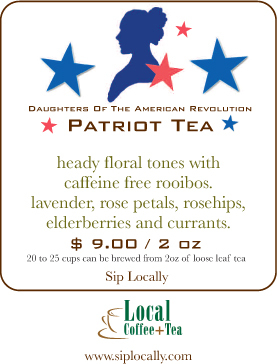 And for more information about Local Coffee & Tea’s Sarasota Collection of Teas – check this out!